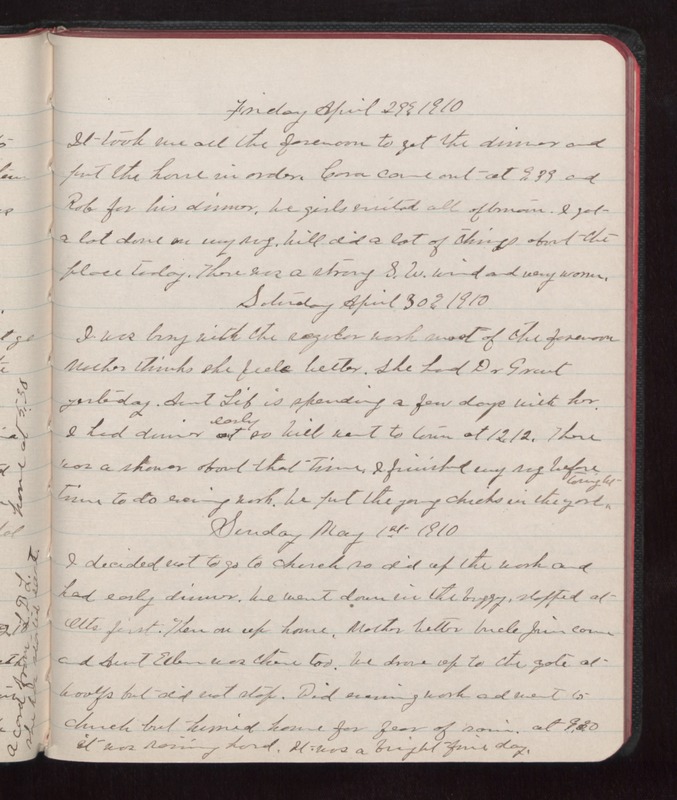 Friday April 29 1910 It took me all the forenoon to get the dinner and put the house in order. Cora came out at 9.39 and Rob for his dinner. We girls visited all afternoon. I got a lot done on my rug. Will did a lot of things about the place today. There was a strong S.W. wind and very warm. Saturday April 30 1910 I was busy with the regular work most of the forenoon Mother thinks she feels better. She had Dr Grant yesterday. Aunt Lib is spending a few days with her. I had dinner early so Will went to town 12.12. There was a shower about that time. I finished up rug before time to do evening work. We put the young chicks in the yard tonight Sunday May 1 1910 I decided not to go to church so did up the work and had early dinner. We went down in the buggy, stopped at Ott's first. Then on up home. Mother better Uncle Jim came and Aunt Ellen was there too. We drove up to the gate at Woolfs but did not stop. Did evening work and went to church but hurried home for fear of rain. at 9.30 it was raining hard. It was a bright fine day.